It's the first new Supra in the U.S. in 21 years. 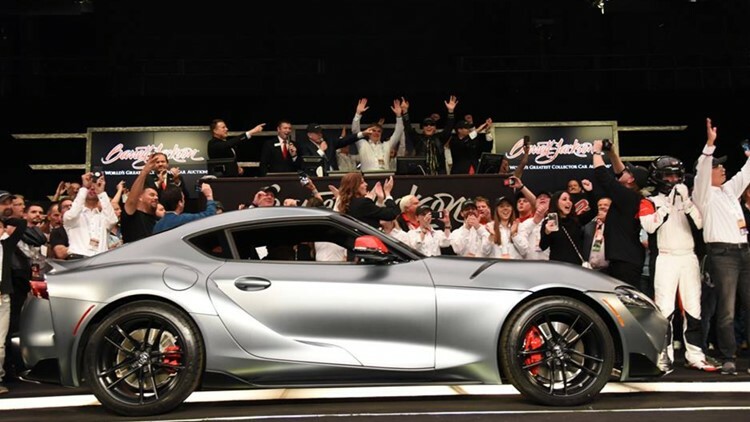 SCOTTSDALE, Ariz. - It's the first Toyota Supra in the United States in 21 years and the demand is high, proven by the car's sold price at the Barrett-Jackson auction in Scottsdale on Saturday. The very first 2020 Toyota Supra (VIN 20201) was sold for a winning bid of $2.1 million on Saturday, the auction company said on its Facebook page. The bid helps benefit Stand4Heroes by the Bob Woodruff Foundation and the American Heart Association. The new Toyota Supra comes with a 335-horsepower inline-six-cylinder engine and has an eight-speed transmission with paddle shifters. Toyota said the design was inspired by the last Toyota Supra, the fourth generation of the car, sold in the U.S. between 1993 and 2002. It can go 0-60 miles per hour in 4.1 seconds and tops out at 155 miles per hour. The Toyota Supra gained wide popularity in 2001 when it was featured in the original "The Fast and the Furious" movie. The stunt car 1993 Supra used in the movie sold at auction for $185,000 in 2015.